The sprawling industrial city of Detroit, the oldest city in America's Midwest, began life as a trading post when French explorer Antoine de la Mothe Cadillac landed on the banks of the Detroit River in 1701 and established a fort. He was later removed because of bad conduct, but unlike its outpost commander, the settlement of Detroit was flourishing. 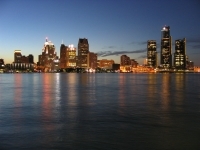 In 1796 Detroit officially became American, and by the early 19th century had already earned a reputation as a centre for the manufacturing industry, particularly kitchen ranges. As most people now know, however, Detroit did not go on to become the stove-making capital of the world. The city is renowned as the automotive centre of the globe, birthplace of the motorcar and home to some of the nation's top brands. Originally automobile empires were established by Detroit families like Ford, Olds, Chevrolet and Dodge, which have become household names, thanks to the invention and perfection of the motor vehicle production assembly line, which began in Detroit. It is not only hard work and industrial enterprise that drives Detroit, however. The city in southeast Michigan is also famous for the Motown record label, founded by former autoworker Berry Gordy Jr, which has introduced the world to stars such as Stevie Wonder, Michael Jackson, the Temptations and Diana Ross, to name but a few. Modern 'Motown' Detroit is a little decayed and shabby, having suffered a decline in fortunes, but efforts are being made to increase the city's appeal as a tourist destination, and there are several attractions worth seeing. In the downtown area new hotels and restaurants are appearing to complement the sports stadium, and there is a focus on the arts, particularly in the city's historic theatre district. The Renaissance Center, a group of seven interconnected skyscrapers, provides the best views of downtown Detroit.